It's easy to miss the opportunities that lie beyond our four walls — the chance to do something unique, something exciting, something unforgettable. Working with MAF is an adventure like no other. Visit places you've only read about, see things you've only heard about, do things you've never dreamed you'd be able to do. God has given us just one life on this earth, so pack your bags and climb aboard the MAF adventure. You shield your eyes against the glare of the blazing mid-morning sun. Your eyes dart back and forth, scanning the horizon, searching for the source of the sound as it rumbles across the plain. Then it appears. A tiny dot at first, but growing larger with every passing moment. Maybe it’s a regular weekly flight bringing medical supplies to restock a local village clinic, or a box of Bibles translated into your language for the very first time. Maybe it’s delivering a teacher, a community nurse, an aid worker, a team of evangelists. Or maybe it’s coming to airlift a sick or wounded child in desperate need of emergency medical attention. Every single part of this school building, from the smallest screw to the roof, came in on a MAF plane. This has transformed the community. As we partner with like-minded organisations transformation happens. As we deliver the gospel transformation happens. It’s happening as we fly in education, medical supplies and community development initiatives. We are in it for the long haul. Join us now and be part of real transformation. Opepeytato lives in a small village in the highlands of Papua New Guinea and is in grave danger. She is suffering from pregnancy complications. It’s a breech birth and the risks to her unborn child are high. Opeyeytato is 200km from the closest hospital. The scary reality is that she or her unborn baby may not survive the journey by foot through the jungle and around mountains. But that’s were we come in. In a few hours, MAF were able to conduct a medevac flight, collect both her and her anxious husband and bring them to the nearest hospital in a flight that would take just 30 minutes. In remote communities medevacs like this happen all the time. MAF is a lifeline to thousands who would otherwise die. You can be part of this rescue. You can be part of saving lives. Come and be part of something bigger. The harvest is plentiful but we urgently need aircraft engineers, pilots, managers and aviation support staff to fulfil this mission. We also need teachers, accountants, IT technicians, administrators, instructors and many more professionals to make this global mission happen. Here in the UK we need volunteers to engage, inspire and encourage others to support the life-changing work of MAF. Sign up for our ‘online journey’. Here we’ll show you more of what it’s like to be part of this worldwide movement. 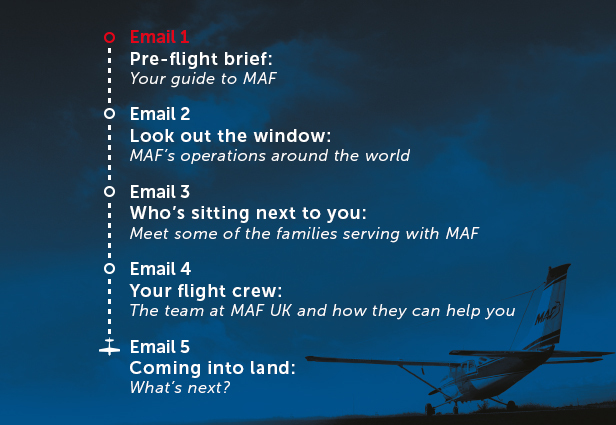 You will receive a series of 5 emails telling you more about MAF, where we serve and how to take the next step.